Europa Puppy wet is complete balanced hypo-allergenic wet diet for puppies from 8 weeks to 12 months of age.Europa puppy wet can be fed on it's own or accompanied with dry food which has proved great for even the fussiest of eaters. 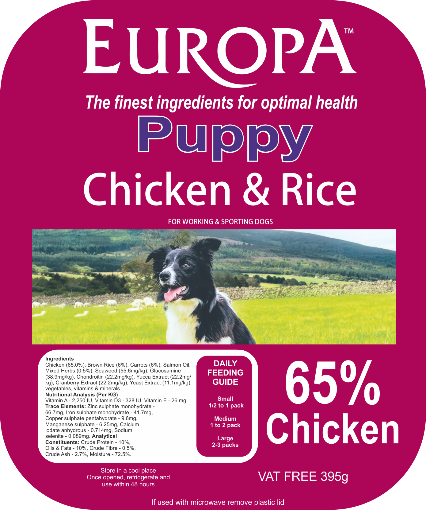 Europa Puppy contains 65% chicken making it a great diet for all puppies including working and sporting pups. This is an approximate feeding guide, the basic rule of the amount that a puppy should eat is 2-3% of their expected adult weight, this is very important that you stick to the correct guidelines as to not over or under feed your puppy. Please click the link below for more tips on how to care for you new puppy. Store in a cool place. Once opened keep refridgerated and use within 48 hours. Chicken (65%) Brown Rice (6%) Carrots (6%) Salmon Oil, Mixed Herbs (0.5%), Seaweed(55.6mg/kg), Glucosamine(38.9mg/kg), Chondroitin(22.2mg/kg), Yucca Extract (22.2mg/kg), Cranberry Extract (22.2mg/kg), Yeast Extract (11.1mg/kg), Vegatbles, Vitamins & Minerals. Crude Protein-10%. Oils & Fats-10%. Crude Fibre-0.5%. Crude Ash-2.7%. Moisture-72.5%. Please ensure you puppy always has fresh clean drinking water available.